If you’ve heard of the 10x business boot camp, then you know that anyone who understands the concepts can not just double-down on their business, but can increase their revenue by 10x! Otherwise known simply as 10x secrets. 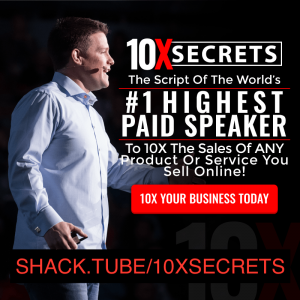 Essentially the concept is this, become a paid speaker and earn millions – it’s a dying art that only a few people still know how to do and those few make millions within minutes! Figure out what is keep the audience back or blocked? Tell the audience a story that trumps their false beliefs then you’re in! Why do you need 10x Secrets? If you didn’t know, the 10x bootcamp sells for $3000!! The reason behind the whole system is to make you AWESOME at telling emotional and engaging stories to BIG audiences and walk away from it all with tons of cash in your pocket. Imagine the rush — stepping in front of a camera or on a stage where there are 100,000 eyeballs watching you … you tell you story, your back story, how you got here from where you were, your struggles, your successes and the people can relate! They get to emotionally connected to you and your story that when you casually mention the product or service you’re selling, they’re IN! They throw their wallets at you! That would, indeed, be a mega rush! What do you get with 10x Secrets? Simple process to 10x your business in only 12 months! If you’re just starting out, you might be more interested in the 30 day challenge instead – where you learn how to create the perfect sales funnel and product and launch it in only 30 days time.